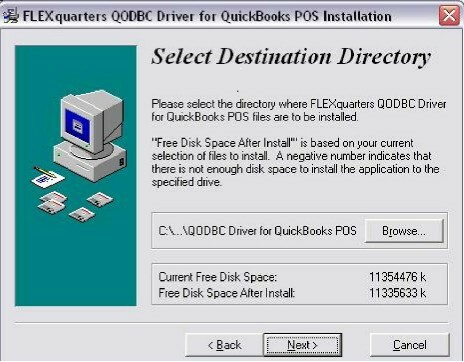 Double click the QODBC POS version icon to launch the installation process. Follow the steps in QODBC for POS Manual to finish the installation. Double click the QuickBooks POS icon to launch QuickBooks POS. If it's the first time you open your QuickBooks, it will pop out a window asking you to input a unique name for the new company data. You can also edit your company data name via menu File -> Company Data. Here I input “test” as a new company data name. 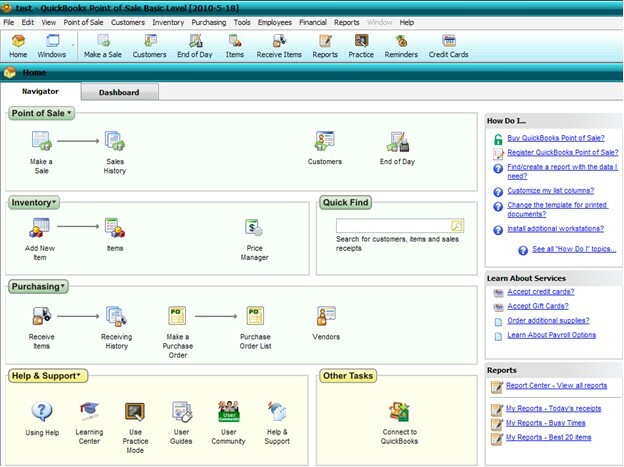 Then click OK.
Then return to the QuickBooks POS home interface. 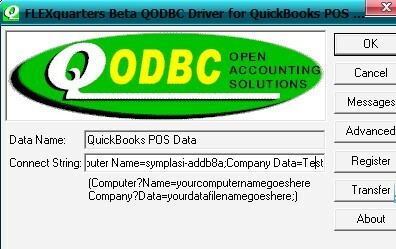 Open the QODBC POS Setup Screen via Start -> All Programs -> QODBC Driver for QuickBooks POS -> QODBC POS Setup Screen . 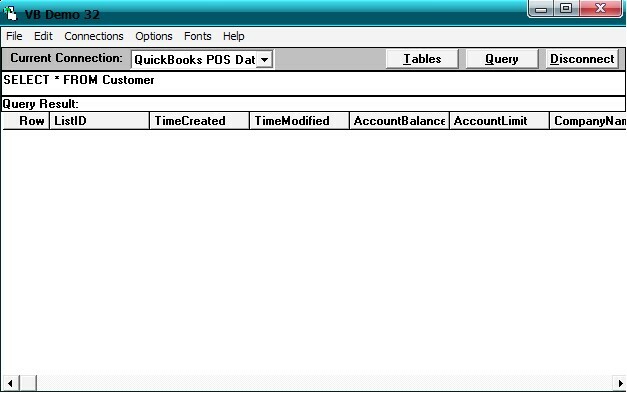 Data Name is a display name for your QuickBooks POS data (QuickBooks POS Data, QBPRO, My QB Data, etc.). Here I choose the default DSN QuickBooks POS Data. Here Connect string includes two parameters: Computer Name and Company Data. Input the value of Connect String and then click OK.
Click on the VB Demo icon to launch the demo. 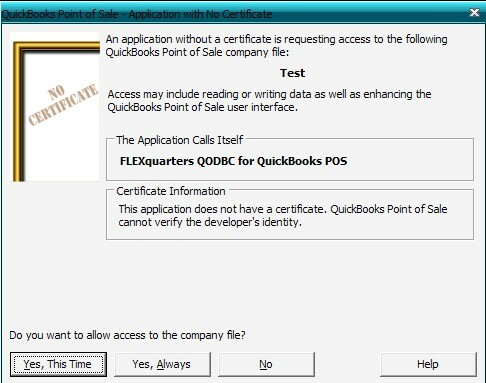 To establish a connection: From the menu bar select Connection -> Add a new connection, select the QuickBooks POS Data Source you want, Click OK.
After you click OK a Q ODBC splash screen will pop up if you are using the Free QODBC Basic Edition of the product, and a mouse click will allow you to continue. No such splash screen appears in the registered version. When the driver starts, QuickBooks POS will ask permission for the driver to access your QuickBooks POS data. Answer Yes, Always to this and the Q ODBC driver is added to the Integrated Application list. This will allow applications to integrate with QuickBooks POS data when QuickBooks POS is running on the desktop. There may be instances in which you want an integrated application designed to share data with QuickBooks POS to access QuickBooks POS files automatically, without user intervention. This might permit, for example, a particular application to run during the night when there is no other activity in the company file. Also QuickBooks POS need not be running for ODBC compliant applications to access the data files while setting in this mode. Then you can run the query in VB Demo now. I'd like to buy the driver. Can you explain me more about the product? I have quickbook POS (6 HeadQuarters) and I build a SQL Server to collect data from those HQ in order to create a data warehouse for our company. What should i buy? and How many ODBC should i buy? As you want to use MS SQL Server you need a QODBC Server Edition License.